In order to generate better and more effective fertilizer alternatives for agricultural producers, as well as to reduce the environmental, economic and health impact, researchers from the Center for Scientific Research of Yucatan (CICY), a member of the Conacyt Centers System, developed a nanofertilizer technology that would maximize field production up to 250%. This was revealed by Dr. Ileana Echevarría Machado, researcher of the Unit of Biochemistry and Molecular Biology of Plants of the CICY, who led this project with the vision of solving national and international problems, such as the low efficiency in the use of nutrients in plants, low yields in crops, severe environmental stress and food security. “We need to feed a population that is in constant growth; current fertilizers are very inefficient, that is, 100 percent applied, up to 70 percent can be wasted by the plant, resulting in significant pollution, either to the atmosphere (greenhouse gases) or in leachates that go directly to the water table, “said the researcher. This project participated in the mentoring of the 2018 Northeast Binational Innovation Node (NoBI), where under the I Corps methodology, a research leader, a young entrepreneur and a business mentor discovered the commercialization potential, in this case, of a nanofertilizer technology, as it was published in the CICY’s newsletter. For its part, Marta Lizama Gasca, PhD student in Biological Sciences, Biochemical Option and Molecular Biology of the CICY, explained that during their participation in the NoBI they had the opportunity to conduct more than 100 interviews with agricultural producers and fertilizer distributors from different regions, in order to get to know the demand of the sector, and be able to adapt this technology to specific needs. Dr. Ileana Echevarría Machado explained that scientists from different CICY Units participated in this multidisciplinary work: Biochemistry and Molecular Biology of Plants, Materials, Biotechnology and Natural Resources. She also revealed that tests have already been done to evaluate their effects in laboratory and greenhouse conditions. In addition, its toxicity was also analyzed in animal and plant cells, as well as on soil microorganisms. 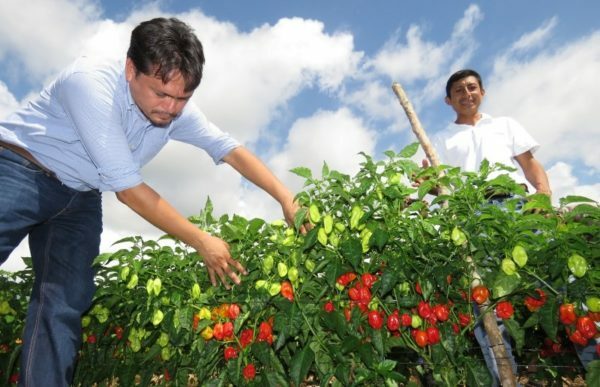 “Our nanofertilizer, under in vitro conditions, has an important effect on the growth of plants and, in fact, under greenhouse conditions it was proven to increases between two and a half to three times the yields in habanero peppers plants,” Echevarría Machado concluded.